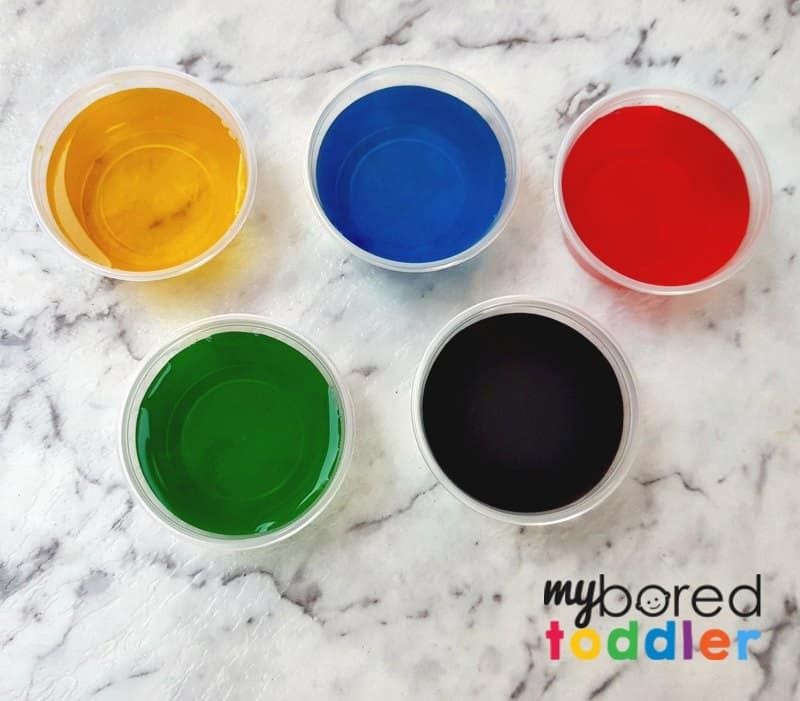 We’ve been focusing on color activities for toddlers this week, which meant it was the perfect time to set up our colorful fizzing sensory bin with vinegar and baking soda. 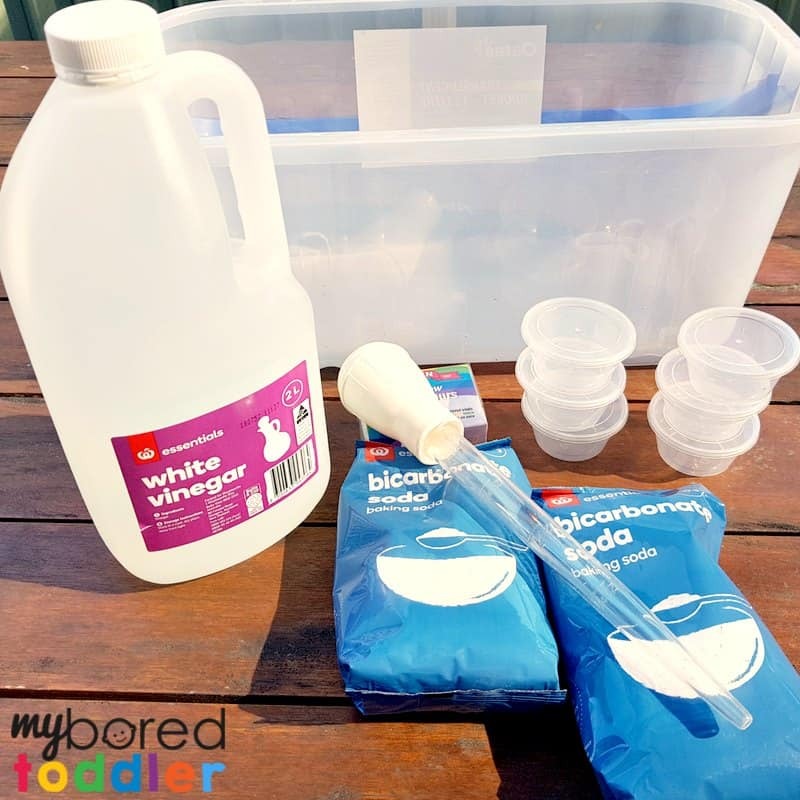 This activity is always a fun one and it’s great to add a bit of science to our activities. 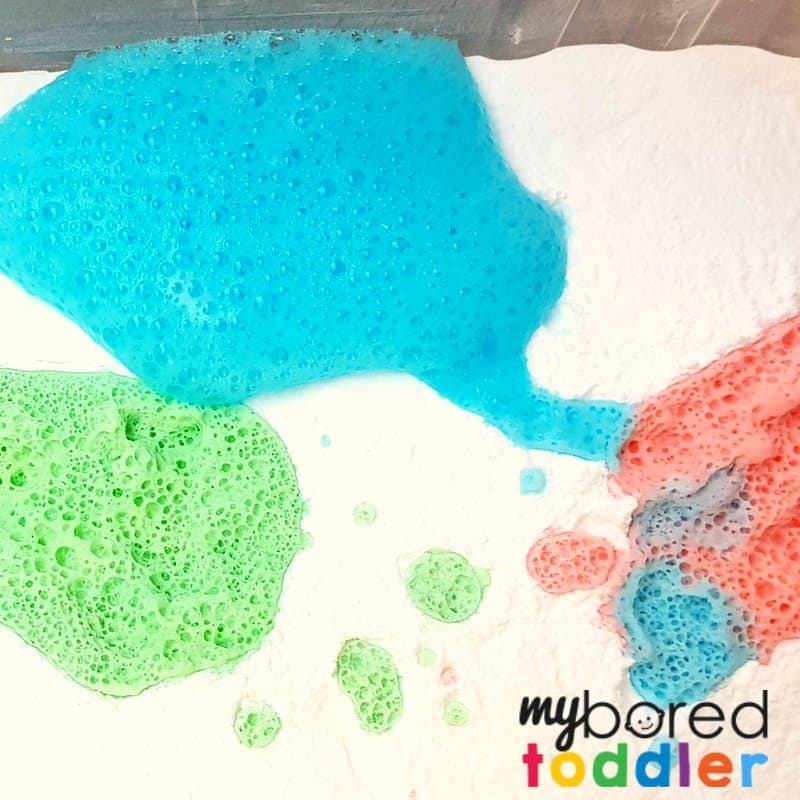 I’m sure you’ve seen the reaction of vinegar and baking soda before, and it’s a perfect sensory play activity for toddlers and preschoolers. The addition of some food coloring makes it even more fun. 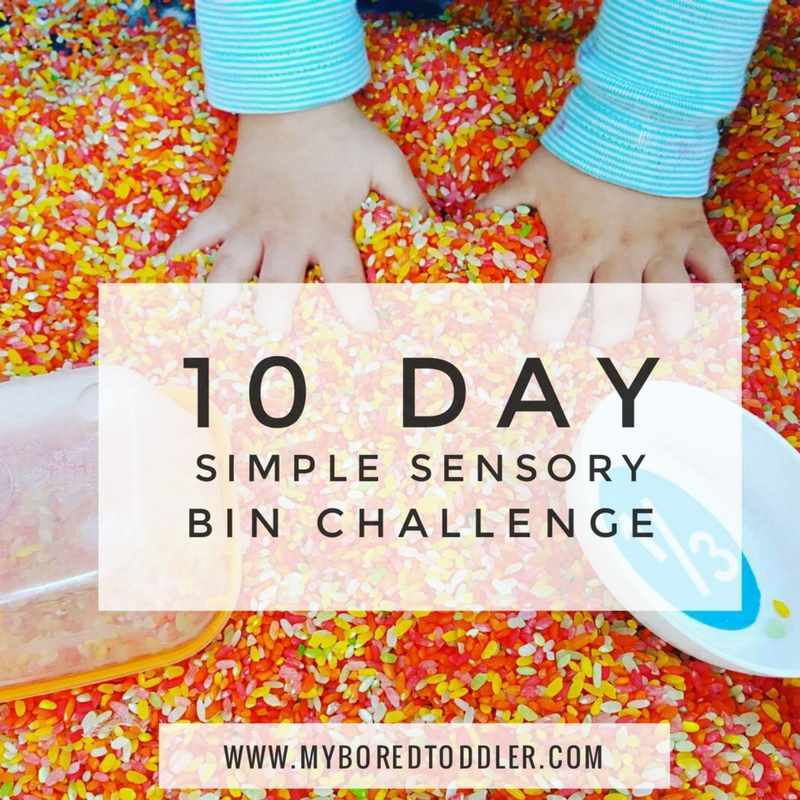 If you love this activity you might also enjoy our FREE 10 Day Simple Sensory Bin Challenge (sign up HERE). 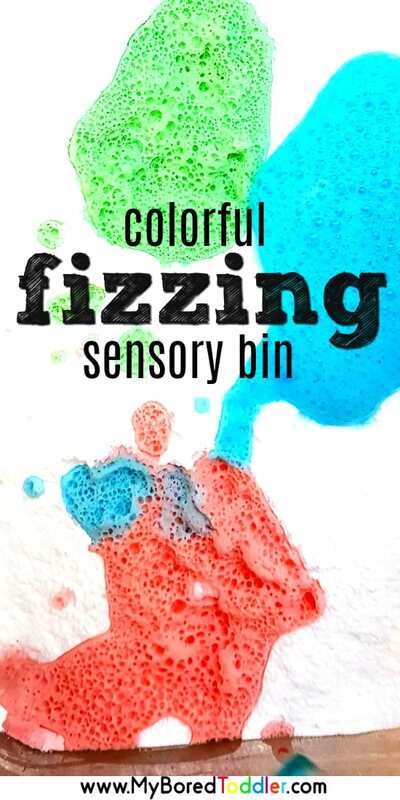 A colorful fizzing sensory bin is an inexpensive toddler activity to set up. Assuming you already have a container, you’ll spend less than $10 for everything you need. 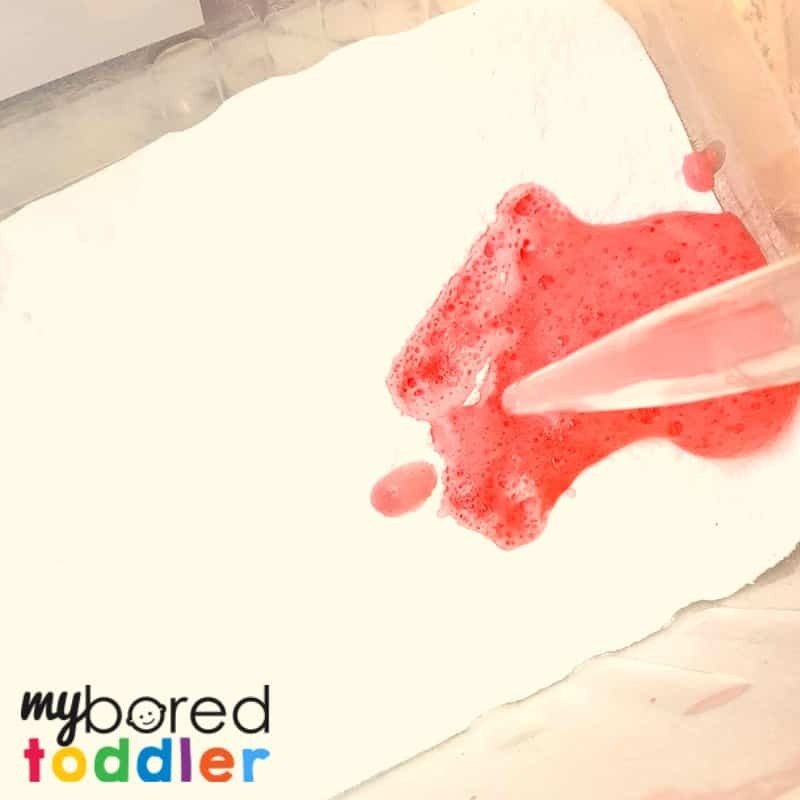 The main item that I love using in this activity is the turkey baster. 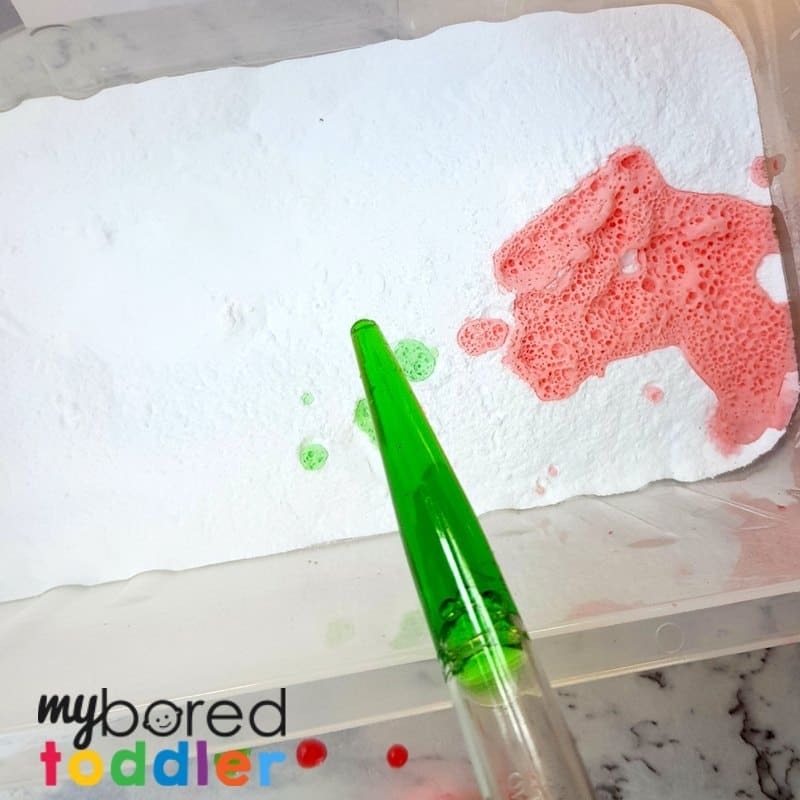 It’s great for fine motor skills, and the fact that it’s larger than a medicine dropper means that it’s easier for little hands to use. You can get one for less than $4 HERE on Amazon or you can normally find them at your dollar stores. Plastic container. I used a small one like this. Bicarb soda or baking soda (same thing, just different names depending on where you live!). You want enough to fill your container. I used the two bags you can see in the photo. Turkey baster like THIS ONE. 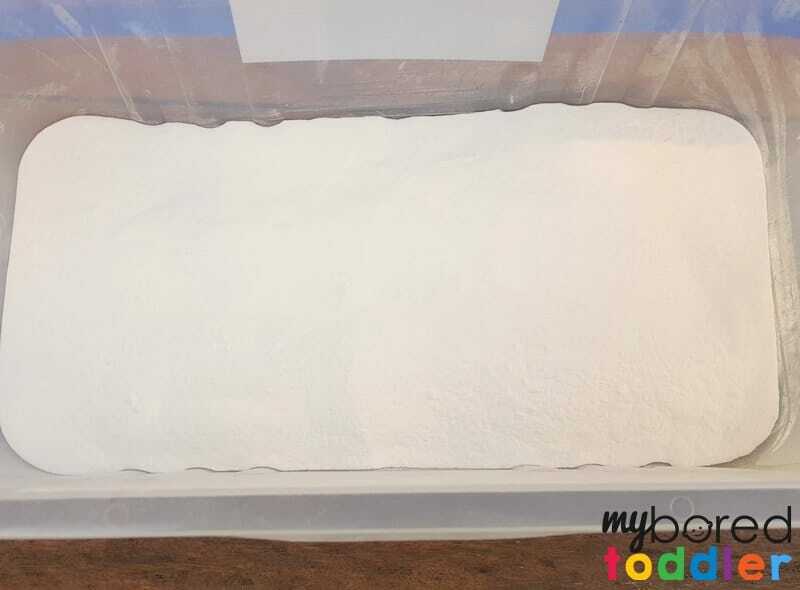 Fill up your container with the baking soda. 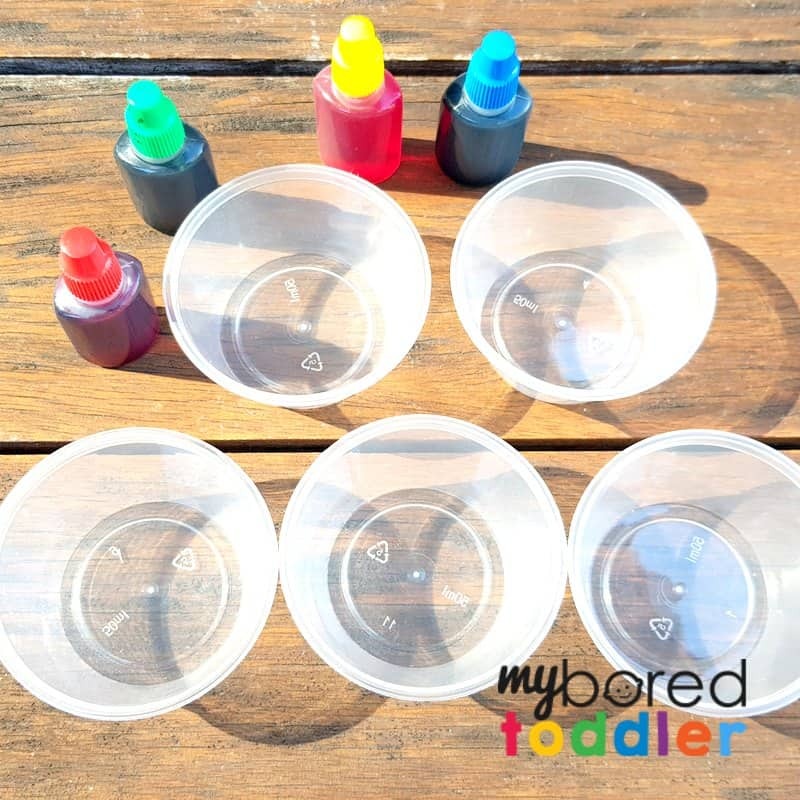 Add a few drops of food coloring to each container. 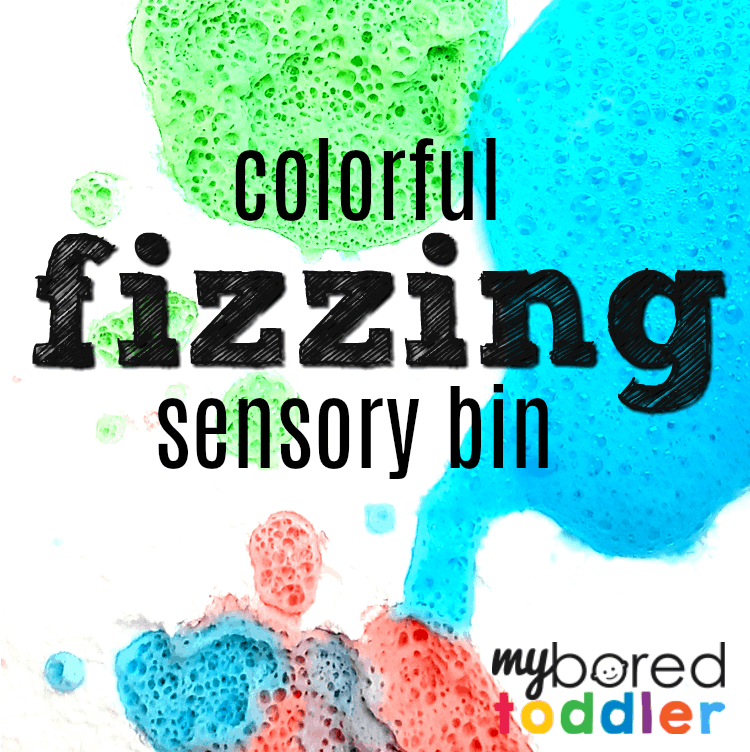 You can mix the colors to make new ones if you like (we mixed blue and red to make purple). 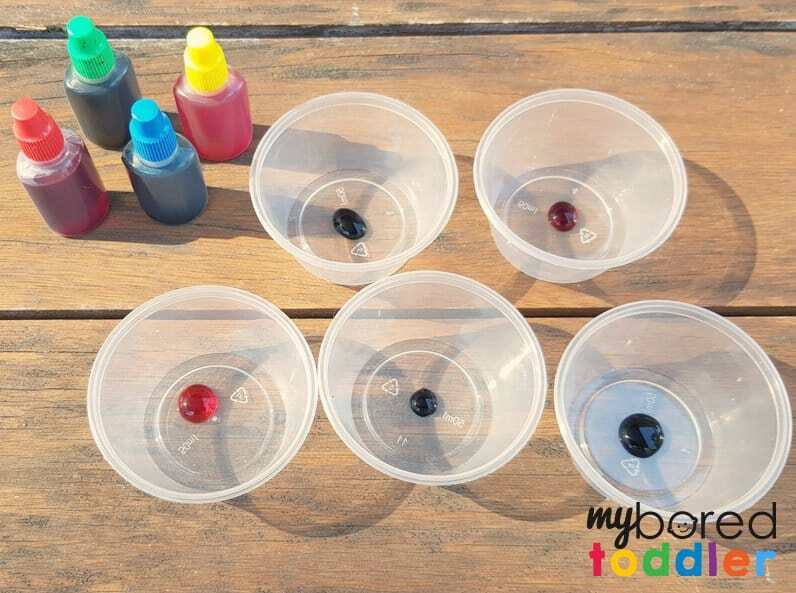 Add the vinegar to your food coloring. Don’t those colors look inviting! 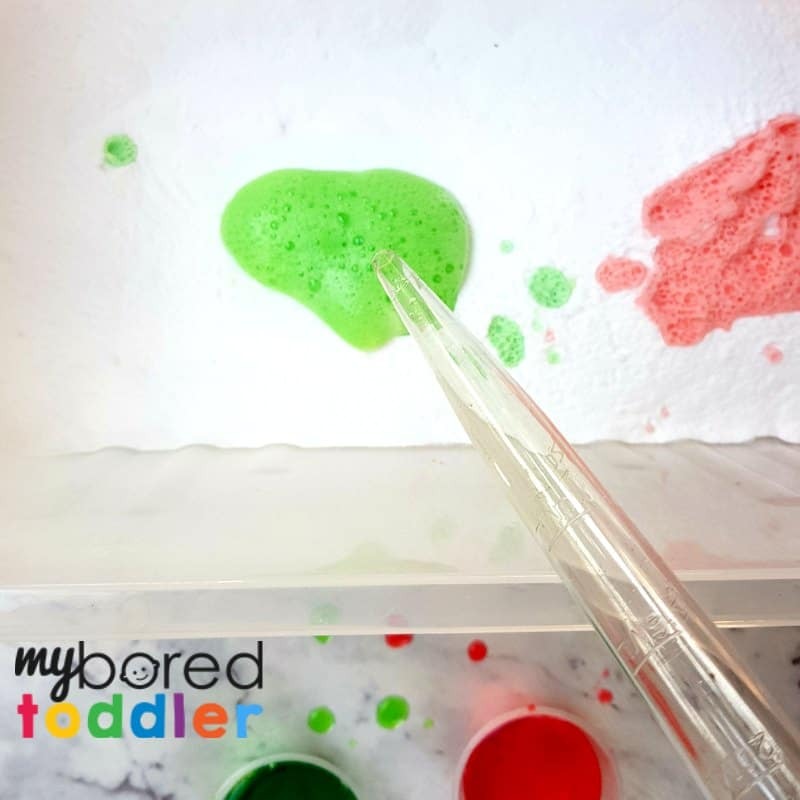 Let your child have the turkey baster and pick up some of the colors. They may need to be shown how it works but normally get the hang of it quite quickly. 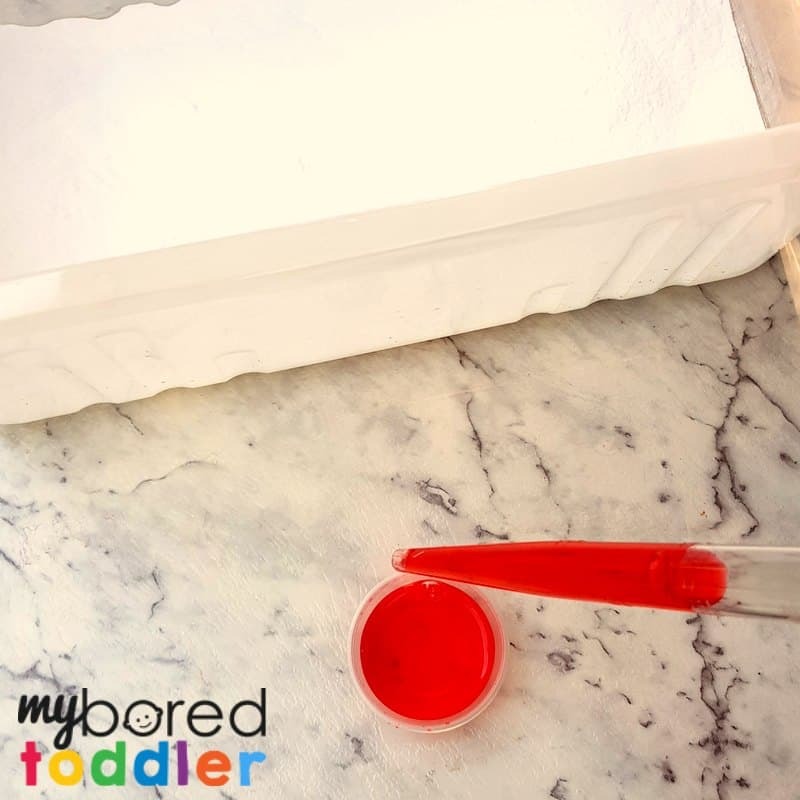 For the younger toddlers you can help them with this bit and let them do the squeezing part. Can you hear it making sound? What do you think will happen if we add another color? 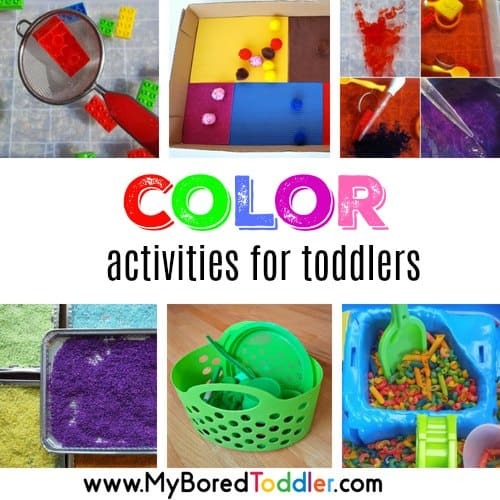 The children will have heaps of fun choosing different colors and seeing the patterns that it makes. 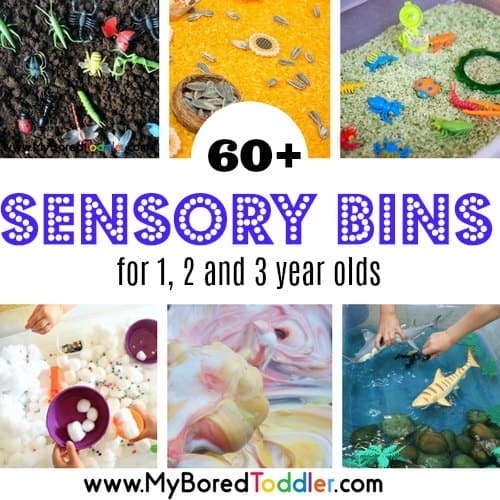 As you go on the sensory bin will get messier and the colors will mix but that’s the fun of it! We actually extended this activity by adding dinosaurs to it at the end (we love these ones). This worked well as by then it was a big brown mess!